British cooks agree that British Bramley apples are the best cooking apples. But why? It's to do with the balance of sugar and acid found in the Bramley apple. Bramleys contain more acid and less sugar than other apples, so they keep their tangy flavor when cooked. 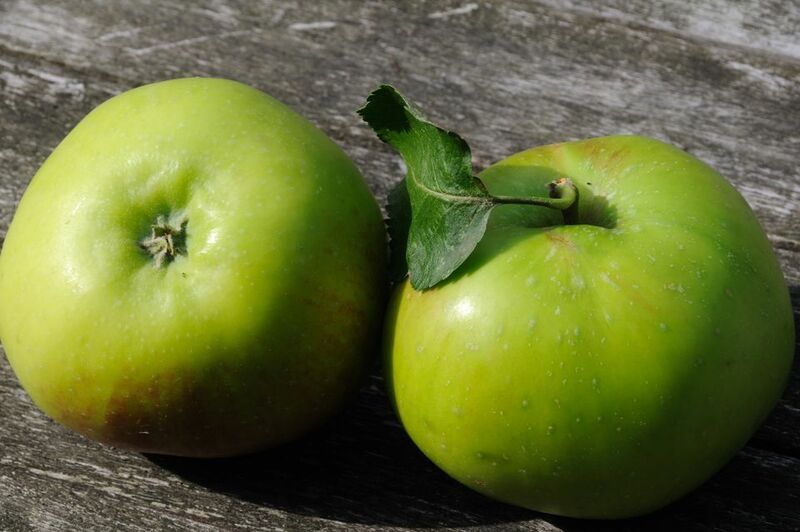 The Bramley also has a delicious 'melt-in-the-mouth' texture which again is retained when cooked. Dessert or eating apples have lower levels of acid and higher sugar content, which gives them a sweet flavor for eating but one that is lost when cooked. It is amazing to think that when a young girl, Mary Ann Brailsford planted pips in her garden in 1809, little did she know that a few years later those pips would grow into a tree bearing fruit that became known as Bramleys Seedling. Matthew Bramley bought the cottage and while he lived there was asked by a local nurseryman, Henry Merryweather if he could take cuttings. Bramley agreed on the condition the apple be named after him. Today and some 25,000 tonnes of Bramley's are sold each year, and a further 58,000 tonnes used commercially in apple products such as pies, sausages, cider, and juices. They have a powerful source of antioxidants, inc polyphenols, flavonoids, and vitamin C.
Are a good source of fiber. One large apple has 5.7 grams of fiber. Diets high in fiber are correlated with a reduction in the risk of developing heart disease. The antioxidant content is linked to the prevention of lung cancer, improved lung function, and the prevention of type II diabetes. Vitamin A helps maintain vision and keeps the immune system healthy. Flavonoids in the apples called quercetin are shown to have anti-cancer properties. In traditional medicine cooked apple helps stop diarrhea. Pies, cakes, crumbles, puddings, and desserts. The ways are endless. Add stewed apples to hot or cold to breakfast cereal or porridge. Add to soups, stir-fries or rice dishes. Apples pair well with spicy foods and other savory dishes. Cooked apples taste great with other fruits and vegetables, like cranberries, sweet potatoes or carrots. Use Bramleys to make sauces or salsas to accompany meat, chicken or fish. Use cooked apples on pancakes or waffles for breakfast. Bake Bramleys with cinnamon & raisins in the microwave for a quick dessert. Great flavors that go well are maple syrup, honey, citrus fruits, cloves, and nutmeg.